Growing up I had always been told that my grandparents originally came from Bari. So last year when we began planning our trip to Italy I decided I wanted to include a visit to the birthplace of my grandparents, even though Bari was quite a distance from where we planned to spend our vacation. First I did a little research on the city itself and found that even though it sat on the Adriatic Sea, it was primarily an industrial port town with little appeal to tourists. I then began trying to find more detailed information about my family’s roots before they came to the US in the hopes of learning more about the specific area they came from, maybe the circumstances of their migration and who knows, maybe even find a distant cousin that I could visit in Italy! Between the Ellis Island Foundation and Ancestry.com I learned a couple of important facts. First, the original spelling of my family name did not include the letter “h”. It was probably changed upon my grandfather’s entry at Ellis Island where the English speaking immigration official simply wrote the name Pop gave him phonetically. Second, I learned that both of my Grandparents were not actually from the city of Bari, but came from a small town 40 miles away called Gioia del Colle (translated to mean “Joy of the Hill”). I found it on the map and did some research. Then, in the hopes of narrowing down the geography even further, I wrote to the records department of the Comune di Gioia del Colle asking for both my grandparents’ birth certificates. I was able to obtain Pop’s but they are still looking for Noni’s. Nevertheless, I now felt the beginnings of a connection with the town of my ancestors. We included a stop in Gioia del Colle as part of our itinerary, although it would consist of only a couple of hours before we drove across the peninsula to Salerno that evening. I figured I would befriend someone at the town hall, get a quick flavor of what the town was all about and continue my research when returning home. It was a 6 hour drive from our hotel in Umbria and we got off to a late start. As we arrived in Gioia del Colle, it quickly became apparent that the romantic vision I had in my head of a quaint Italian village built of medieval stone dwellings where everyone looked just like Noni and Pop….this was not to be. What I saw was a modern, blue collar suburban town complete with traffic congestion, graffiti covered walls and mid-rise tenement housing. Our GPS was a wonderful thing on highways and major roads, but in the congested city streets of the smaller towns it had a habit of sadistically sending us in non-concentric circles. The town hall or anything resembling it was nowhere to be found and the traffic was so heavy we could not find a place to even stop and try to ask someone. My optimistic enthusiasm about immersing myself in the same environment that my beloved Noni and Pop shared as young people was waning fast. After close to an hour of weaving in and out of a sea of Vespas and Fiats, up and down side streets doing our very best to avoid turning the wrong way on the many one way avenues, I told Nancy that if I could just find a parking space I could take a few pictures to prove that I had actually been there. The hunt now turned from looking for the municipal building to a simple place to park the car. Neither was anywhere to be found. I resorted to snapping nondescript pictures through the windshield and side windows of the car when we would stop at a traffic light. Nancy was looking between cars, down alley ways and in front of buildings for anywhere that would provide enough space for us to squeeze the Peugeot into long enough for me to walk around and take some pictures. This went on for another 30 minutes with no luck whatsoever. So after 90 stressful minutes, we decided that it was time to conclude our visit to Gioia del Colle and start the 3 hour drive to Salerno. 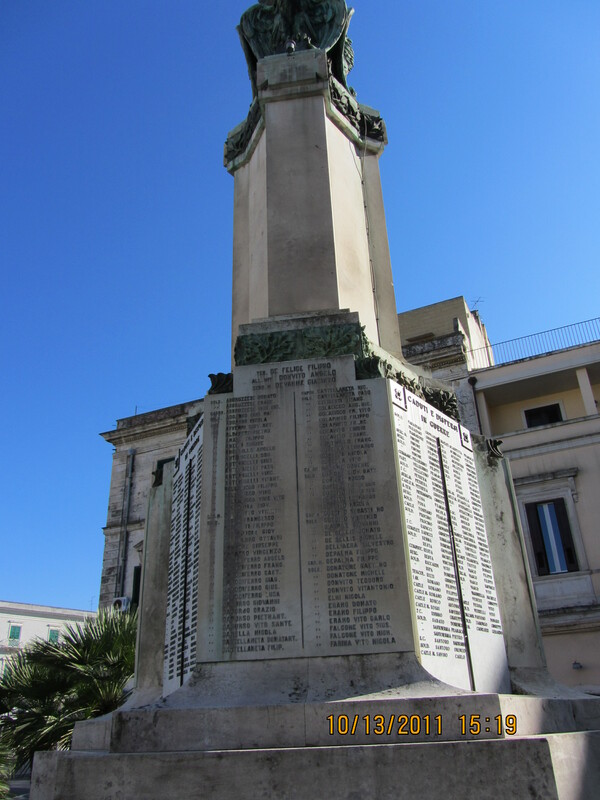 As we drove through the central square of Gioia del Colle, my wife spotted a lone parking place at the base of a white monument just to the left. “Perfect” I thought, this is a lovely square and I can get some decent pictures, so I whipped into the space and grabbed the camera. I wasn’t out of the car more than 30 seconds when I could hear the muffled voice of my wife from the car calling my name. I looked over and she was frantically barking my name while pointing forward through the windshield. I would describe the look on her face as chaotic shock as she simultaneously kept flailing her finger toward the big white monument while trying to open her car window with the other hand. 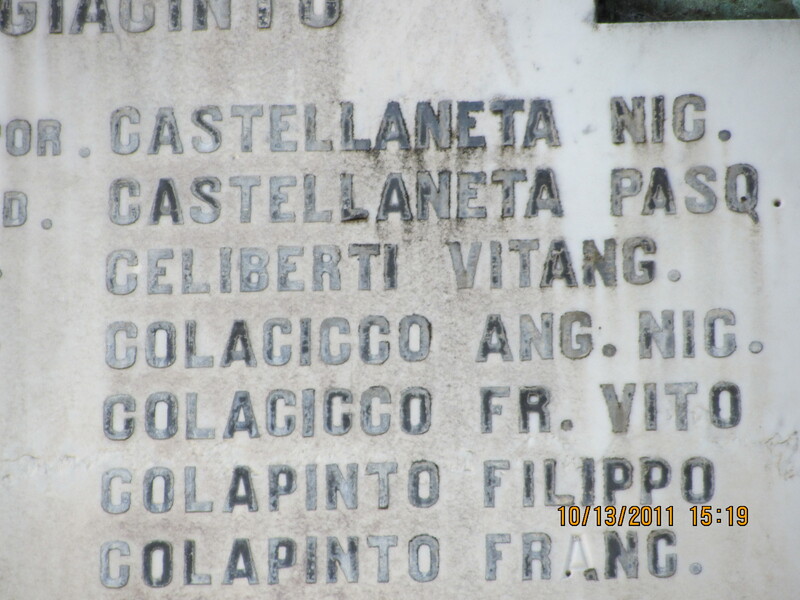 “It says Colacicco on the monument!” she kept repeating over and over. 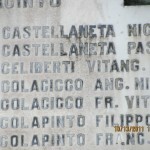 Sure enough, I looked up at the side of the monument facing our car, that was parked in the only parking space that (to my knowledge and experience) was available in the entire town of Gioia del Colle, and right there, the 4th and 5th names down it said “Colacicco”. 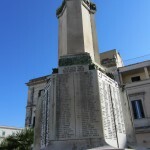 The monument was erected as a tribute to soldiers of past wars who were from Gioia del Colle. After snapping a few pictures of the monument and zeroing in on the section that showed my family name, I worked my way down the list of names which wrapped in alphabetical order around the 4 sides of the monument. 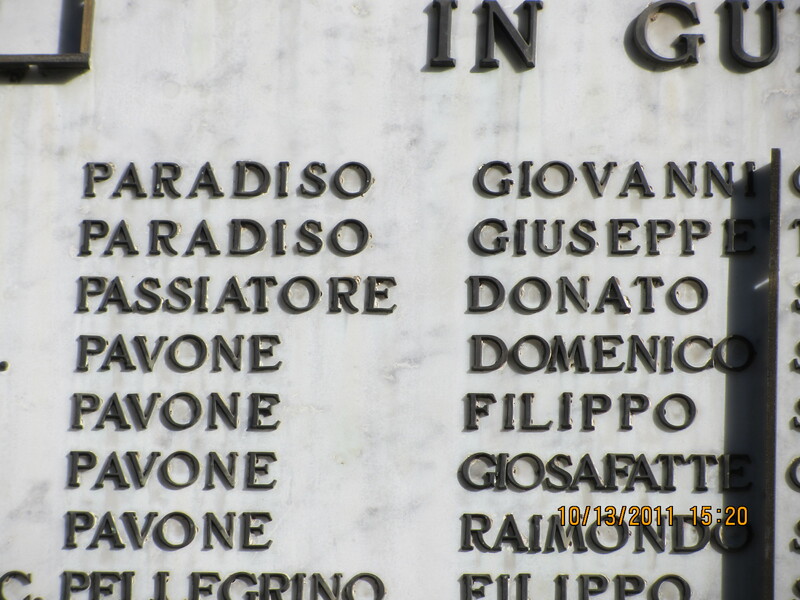 There one panel over was Noni’s maiden name, Passiatore. More to follow as I continue my research. Very great story Dan ! Thank u for sharing your family history. It is something to be proud of.